and the others manage to get all the members, except themselves, killed! POP: "Mr. Fuselli, I told you my restaurant is not for sale! to see your mudda' roughed up?" POP: "My mother has been dead the last twenty years!" ROCCO: "But do you think that would stop me?!" 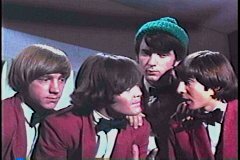 DAVY: "Now, wait a minute!! You can't push us around!" DAVY: "You're pretty tough with an old man!! How about trying someone your own size!" ROCCO: "There ain't nobody here my size!" MICKY: "Then you should get out of the business!" Fuselli is a rough, vicious, mean type a-person!" MICKY: "He's just an average hood!" DAVY: "Now I'm telling you this guy's tough! He even wears a pin-stripe suit!" MICKY: "What's so tough about that?" DAVY: "Got real pins in it!" the minutes of the meeting?" that's a new meeting record!" FUSELLI: "There's work to do, so let's get to it! hat check girls, cooks, cigarette girls--why are you standing here?!" MICKY: "We've got to contact the Inspector!" in the middle of the meeting!" MIKE: "Yeah, Rocco's guarding the front door!" PETER: "And the food will get cold!" of the city to the four of you! Any objections?" MICKY: "Yeah, The Purple Flower Gang objects!" RED: "The Purple Flower Gang? I thought they were away for good!" then why are you wearing white carnations?" MICKY: "You know how tough it is to get purple flowers, baby?" FUSELLI: "I thought you guys were in the state pen!" MICKY: "We busted out yesterday!" to make sure the food is poisoned!" FLORA: "I usually bring a dog along to check for poison." BENNY: "Well, where is he?" FLORA: "He hates Italian food!" PETER: "Boy, I'm glad to see you!" INSPECTOR: "Grab him, it's The Purple Flower Gang!" POLICEMAN: "I thought we had all these guys in the can?!" INSPECTOR: "Yeah, it must be another one! PETER: "My flower's white, white!!!" INSPECTOR: "Don't try to kid me! I know how tough it is to find purple flowers!" and the filling station over at Essence!" INSPECTOR: "Hey, you getting all that?" PETER: "And the sinking of the Lusitania was mine! Great Train Robbery was mine!" PETER: "One more thing, take a letter to my mother!" No spagetti or meatballs were hurt during the making of this films.